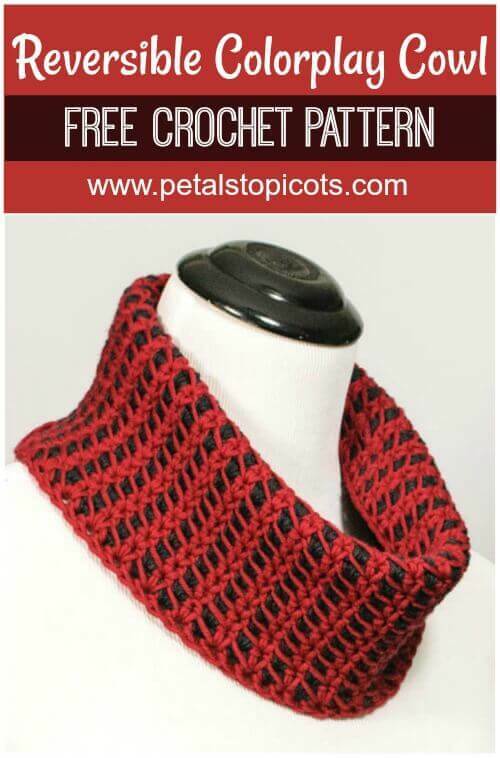 I love the stitching of this Reversible Colorplay Cowl Crochet Pattern and how the colors mingle together … and best of all it’s reversible! Such an attractive option for keeping you cozy on a chilly day. Enjoy! Notes: Alternate colors and turn as noted with each round. Take care not to work over the legs of the stitches from the previous round. 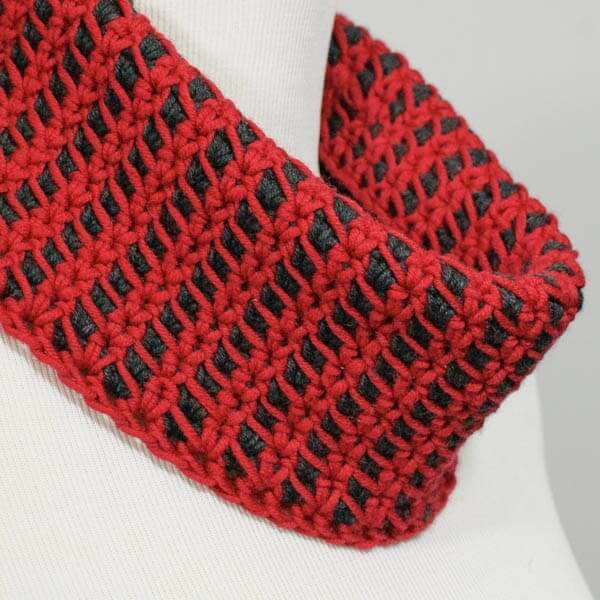 To customize the length of the cowl, work a multiple of 2 chains. 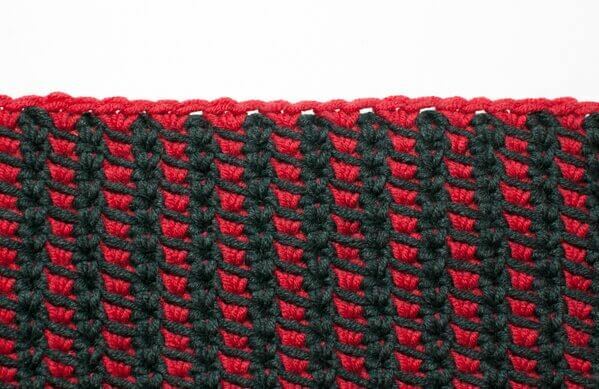 CA = red; CB = black; Lsc = long single crochet. With CA, chain 72 and join in furthest chain from hook to make a ring taking care not to twist the chain. Round 1: Ch 1 (does not count as st here and throughout), *work 2 sc in next ch, skip next ch, repeat from * around, join with CB and turn — 72 sc. Round 2: Ch 1, work 2 Lsc in each skipped chain 2 rounds below taking care not to work over the legs of the stitches from the previous round, join with CA and turn — 72 Lsc. Round 3: Ch 1, work 2 Lsc in the 2nd sc of the 2sc-grouping 2 rounds below taking care not to work over the legs of the stitches from the previous round, join with CA and turn — 72 Lsc. Rounds 5 through 31: Repeat Rounds 3 and 4 through Round 31 or until desired length is reached. Do not change color to join last round. Pretty cool stitch pattern, eh? 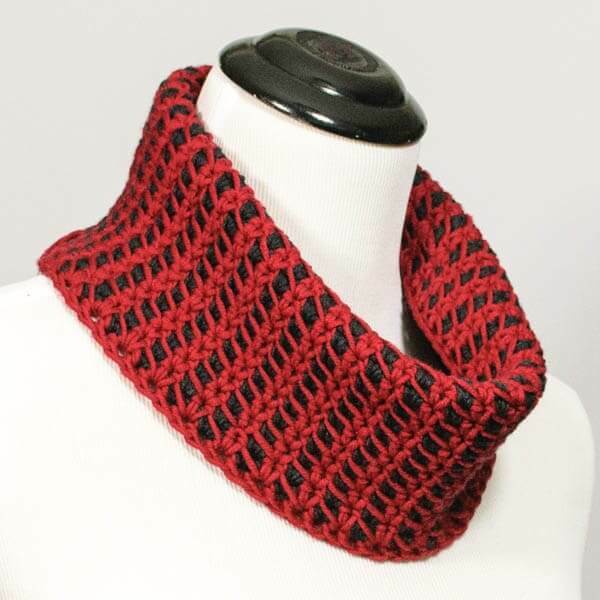 I’m thinking of working up another in a longer infinity scarf version. And here is what the cowl looks like when you reverse it! What a lovely rich texture! This would make a gorgeous and sophisticated cowl for men. I love this, thank you very much! What does Lsc stand for ? Lsc is not listed in the abbreviations glossary and neither are the symbols used in this pattern. Please explain.